BEST OF BROADWATER Award and Best International and Inkwell Theater Playwright Promise Nominee! Two added shows Friday June 29 at 9:30 p.m. and Sunday July 1 at 7:00 p.m.! A 15 year old schoolgirl jihadi. An educated high-society 17 year old girl in Victorian England. Born 175 years apart, yet both facing the similar horrors ahead of them as they travel towards the East. An important and timely drama, by acclaimed UK playwright Henry Naylor (The Collector, Angel, Borders). 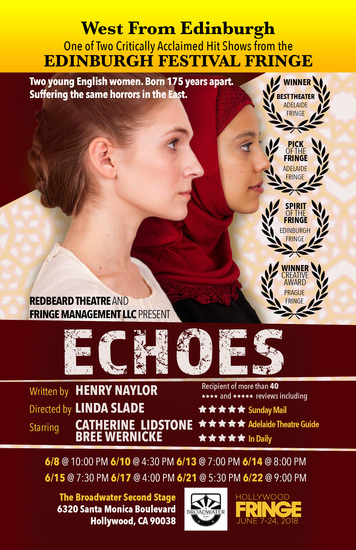 Echoes won The Spirit of the Fringe Award at the Edinburgh Festival Fringe, the Best Theatre Award and Pick of the Fringe at the Adelaide Fringe, and the Creative Award at the Prague Fringe.